Earlier this month, a Twitter user in Japan uploaded a photo of a "bunny smartphone case." The image was retweeted over 37,000 times and, of course, has spawned a meme. Of course! 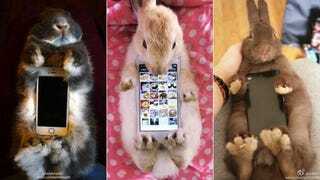 It goes without saying that people aren't actually using rabbits as real smartphone cases—like, carrying them around and whatnot. For better or worse, these are photo-ops. As website News Gamme reports, the meme appears to have caught on in China, where people are uploading their photos to the country's micro-blogging service, Weibo. But in Japan, the trend doesn't appear to have stopped at bunnies. There are cat smartphone cases, too, it seems.